VesVes "Besu Besu, Sailor Vesta"
VesVes (called Besu Besu in the dub) is the red-haired aggressive member of the Quartet. She is loud, brash, and somewhat violent. VesVes is the Circus' animal tamer, known as the Magician of Beasts. Her Senshi counterpart is Sailor Mars, and her color is red. She carries a whip. Naoko Takeuchi listed her as being a "Queen" and having a darker skin color than JunJun. She is the fourth and youngest sister, which corresponds to the size and number of her asteroid (although in the anime, she is the second-oldest). 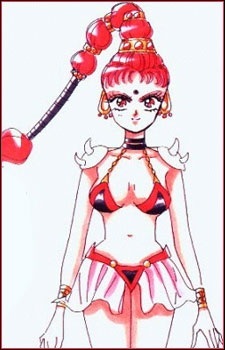 In the manga it's revealed that she is really Sailor Vesta named after the asteroid Vesta and the Roman goddess Vesta. In the anime, VesVes can appear to lack a sense of reality, rushing into things without realizing what she's doing. She once appeared before her target on top of a levitating ball in a flight suit and failed to realize how this wasn't realistic until Chibiusa and her target pointed it out. She is not as picky about her targets as the other three. She tends to command lemures that are animal-themed.